If you spend your days knee deep in email you’re going to want the most powerful email app around, and that’s arguably Newton Mail. It’s packed full of features, many of which you’ll find elsewhere, but you’ll be hard pushed to find them all in a single app. These include support – and instant push notifications – for all types of email accounts, from Gmail and Outlook, to Exchange, Yahoo Mail, Office 365 and more. You’ll also get read receipts, the ability to schedule emails, and snooze emails so they’ll pop up again at a more convenient time. You can even snooze to desktop, so they’ll appear at the top of your inbox next time you log in from a computer. Sender profiles give you more information about the people emailing you, pulling in data from LinkedIn and other social networks, and you can unsubscribe from newsletters with a single tap and set up customizable gesture controls. Newton Mail also works across devices and platforms and you can connect various apps, such as Evernote, Pocket and Todoist, allowing you to add emails to them without leaving your inbox. There’s even an Alexa skill, if you want Amazon’s AI assistant to read and manage your email. And those are just the headline features, there’s too much to cover here. 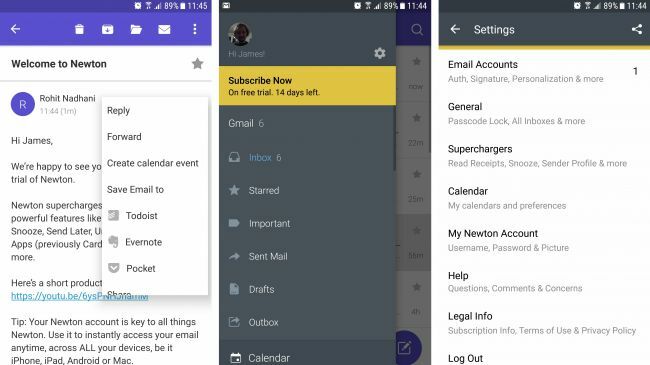 Sadly there’s also a but coming: unlike most email apps, Newton Mail isn’t free. You can try it for two weeks and after that it costs $49.99/£47.99 per year. Pricey, but if you live in your inbox it could prove invaluable.